The McGimpseys are a small family group or ‘Sept’, which broke away from the O’Dhiomasiagh Clan, now called O’Dempsey or Dempsey, who still live in Southern Ireland. We were too proud to sign the Treaty offered to us by the English and as a result we were forced to seek refuge in Ulster and then on to Scotland where we finally settled in the rural area around Kirkcudbright as tenants of Lord Kirkcudbright and Clan McLellan in the Scottish Borders. At that time Scotland was constantly at war with England and there was always a shortage of fighting men in the border areas, so much so that it is interesting to note that at one stage in 1616, there is a record of only one McGimpsey man having children in Scotland and it could very well be that this man was the only young McGimpsey man left, and that we all are descended from him. However we will never know for sure but at that time the family was as small as that. Lord Kirkcudbright was a very rich and powerful land owner with extensive land interests in both Scotland and Ireland and he had two regiments of fighting men, the Galloway Regiment and the Kirkcudbright Regiment, mostly made up from his tenant farmers and their families. During the English Civil War both regiments were sent down into England to fight on the side of Oliver Cromwell. They performed with distinction and returned to Scotland in good order.Soon after that for some reason Lord Kircudbright fell out with Oliver Cromwell who was in Ireland at the time and he sent his two regiments over to Ulster, presumably to protect his land interests there. They were ambushed by Oliver Cromwell’s forces at the battle of Lisnagarvey and cut to pieces. The remaining few men limped back to Scotland, but the result of the whole thing was that there was now not enough men left to work the land. Land prices slumped, two Villages had to be abandoned because there were no men and Lord Kircudbright lost his fortune and most of his land. Indeed his ancestors ended up having to make their living from running a Pub in the grounds of the Castle that they used to live in and his Title went out of existence. Being tenants of Lord Kirkcudbright, the McGimpseys would have been badly affected by all these events and we can only assume that the eight men who fought in the Seige of Derry were in Ulster to look after the remains of Lord Kirkcudbright’s land interests there when the Seige took place. You can see that these eight men, who fought in the siege of Derry in 1688, would all have been close relatives and were referred to ‘as brothers’. When the seven remaining men settled in the rural area around Newtownards they settled mainly in Drumawhy, Loughriscouse, and Ballyhay. One man, probably my (David's) relative went back to Scotland, most likely on the death of his parents, to take over a farm or settle up his affairs. There is evidence of this man’s family in Scotland for a long period before some of them appear to have gone to America around 1770, and the rest came back to Ulster and settled in Antrim, at the Village of Connor near Ballymena. My Great Grandfather, David McGimpsey, was born in Antrim in 1812, but travelled back to Newtownards as a young man, to be with the other McGimpseys there. He married Mary McAuley in Ballyblack Presbyterian Church on 26th August 1837, and they farmed a small farm of 15 acres in Loughriscouse. They later increased the size of their farm to 34 acres. William Martin McGimpsey and his wife Margaret (Martin) were their next door neighbours. William Martin McGimpsey (known as the Blackbird) had a son called Martin McGimpsey who fell in love with and married my Great Grandfathers daughter Ellen and they had a number of children. The townlands of Drumawhy and Loughriscouse adjoin each other, but the townland of Ballyhay is about a mile away on the way to Donaghadee, so over the intervening years the family groups in the different townlands developed separately but still felt very much kin to each other. The social structure at the time in the farming community was such that these small farms should not be broken up or sold and that the land had to be held on to.If a farmer had say seven children, the farm would be left in his will to his oldest son. He would endeavour to make enough money in his life time to buy his second son a farm as well and if he had enough money left he would ensure that his youngest son got a good education so that he could be a benefit to the family. If his daughters did not get married, they would help around the farm and he would ensure that they had a room of their own to sleep in and food to eat, and coal for their fire, for the rest of their lives. If there were any other sons they could be Blacksmiths, or just farm labourers with very little prospects except to work on the farm or to go to America, Canada, Australia, New Zealand or South Africa, to seek their fortune, as many of them did. Your relative Henry James would not be a brother of John McGimpsey who lived in Coal Valley but they would certainly have been related and may have been something like second cousins or something like that as John McGimpsey’s father was a McGimpsey from Drumawhy, and his mother was a McGimpsey from Ballyhay.The last person to be born at the farm in Ballyhay was Pipe Major John McGimpsey Johnston. He died just after Christmas last year. Wow--what a facinating look into our McGimpsey history that we in America wouldn't have the slightest notion about! Thank you so much David for putting the story together and sending it to us. I held up my Supplementary Application on Robert McNeal for over a year trying to identify his wife, then I leave the info off the app. I had decided to research Jane McNeal one last time…I had followed the trail of “Jane/Jean Baker McNeal on the internet websites and knew that she may have been married to Robert McNeal, just not my line of Robert McNeal (the Revolutionary patriot buried at Mt Pleasant). I had found a notation on one of the old DAR applications that referenced Central Presbyterian Church. This Church just recently celebrated it’s 200th anniversary. It’s website stated that it had records 1795-1820s…that looked very promising. After corresponding with the pastor and one of the church historians several times, I learned they didn’t have anything on the McNeals or Flemings, but I was directed to the online records of Temple Hill Cemetery, Geneseo. Molly/Polly McNeal married Isaac Hall and stayed in the Geneseo area. There are a number of cemetery records for her side of the family. That was a small success, but not what I was looking for. Our DAR registrar was getting ready to make her annual trek to Salt Lake City and asked if she could look up anything for me. I asked for the actual will of Andrew Campbell. The Abstract only had names listed. Ye gads, all I can say is the Abstract was very poorly transcribed from the grandfather’s will. The will names Daniel McNeal as Jane Campbell’s father!! I don't remember how I came to acquire this photo of Jesse Gum Jenkins and Susan Margaret Flesher, but I decided to post it since I've been trying so hard to find his parents. I actually have three new ideas that I'm running down, all look plausible---just have to see if any pans out. After doing a lot of reading on the Watson, Walton, Livezey, Roberts families in and around the locations where our Watson line lived (again the main purpose was to identify Rebecca's father), I realize not all of the Watson's continued to follow the Friends (those are the lines that are easier to document). I still don't have all of Isaac's siblings' families, but I was able to link Alice to a very influencial Methodist Minister and Elder, John M. Young. Rootsweb, Ancestry.com didn't have a "tree" linking Alice up to father William Watson, and there were no posted "trees" identifying Alice Watson Young to our line--there is now. John marries Alice when she is eighteen years of age and the following year they move to Ohio, and from Ohio to Page County, Iowa (1859)--the 1850 Census shows them in Wayne Indiana. The 1860 Census has the residence as Nebraska City. In 1863 they settle near Salt Creek--the future Lincoln, Nebraska. (The original intention of Lincoln was for the establishment of a church colony). John is considered a founder of Lincoln, Nebraska. John became a Methodist minister in 1829--that would be about the same time as his marriage to Alice. He was President of the Ohio Methodist Annual Conference for several years and President of the Nebraska and Iowa Conferences for about 20 years. The various Census' identifies children as John, Hannah, George, Isaac, James, Lemuel, Levi, and William. For more information check out the History of the City of Lincoln, Nebraska, A.B. 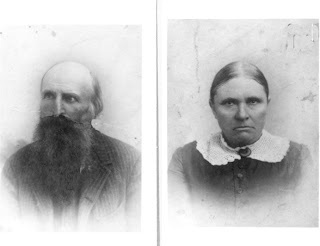 Hayes and Sam D. Cox, 1889, p.74, 75--the book is online through Ancestry.com and HeritageQuest. George Roberts appears to be the father of our Rebecca Roberts (1810-1859. The 1810 and 1820 census shows George Roberts in Muncy, Lycoming, Pennsylvania and the 1830 Fairfield Twp., Lycoming census shows Isaac W. Watson (and Rebecca) living near him, Peter Roberts and George A. Roberts. There are tons of Roberts in the area, but very few Roberts lines have a George Roberts...I'm sorting through all the books eliminating family lines....but it looks like our George Roberts would be the one mentioned in the Lycoming County book. John Else works for George Roberts. John Else marries a Mary Ann Roberts. It would be a logical conclusion that Mary Ann Roberts would be the landowner’s daughter. These are first settlers of the area. The Lycoming Gazette references a 25 Jan 1832 marriage of Eliza Roberts, daughter of George Roberts of Fairfield Township to Frederic Boone of Mifflin Twp, by Rev. Thomas---Rev. John Thomas (a methodist minister) also married Isaac W. Watson and Rebecca Watson. The History of Lycoming County book by Meginness states George Roberts as a trustee for the early Methodist church. Died, At Millville, Columbia Co., PA., on the 25th of 7 mo., 1859, William Watson, aged a little over 90 years. He was the son of Amos and Phebe Watson of Falls Twp, Bucks County, and removed from That place to Muncy, while a young man, near the close of the century. He reside there till 1841, when he reitired from his farm and with his famly removed to Fishing Creek, where he spent the rest of his life. He was an active member of the Society of Friends, and for many years an elder therein. He posessed a robust constitution and was a very industrious and worthy citizen. The many deeds of charity he rendered were a real test of his Christaian benevolence, and as a parent, neighbor, and friend, he was well known for many excellent traits, and especially for his decision of charater. For the last year or more his powers of body and mind gradually declined, and being full of years, he at last sunk quietly to his peaceful rest, having survived his wife about nine years. One of the first marriages in Penn's Dale (this is the Quaker Meeting House in Muncy or Muncy Creek, Lycoming County, Pennsylvania) was the marriage of William Watson to Hanna Walton, in 1800. Job McCarty and Jane Walton in 1808; Jacob Haines and Rachel Ellis in 1815; John Warners and Louis Atkinson in 1821; Henry Encroyd and Catharine Whitacre, in 1823. The Friends' Meeting House at Penn's Dale was founded in 1799. History of Lycoming County, John Franklin Meginness, Brown, Runk and Co, Chicago, 1892. There are 88 references to William Watson in this book. It will take a little time to go through them all since I can't print the pages or copy them, but the book is on books. google.....I'll probably go to the nearest library with the book before the end of the year and make copies of the most interesting pages.....now that I have to pay for all my photocopying I have to be more constrained. Watson is on my maternal grandmother's side. Hopefully by the time I plow through this book I will be able to narrow (or identify Rebecca Roberts' father). Some of these are really large families with similar names so it should be time-consuming. But since I know now at least some of them are Quakers it doesn't look like any would qualify for DAR (revolutionary war patriots) and that was what I started working on these past few weeks. There's quite a few patriots to document. I had some major eye issues over the past six months, so I didn't get much genealogy research done. I had the Mayflower application returned quickly for incomplete information/need clearer copies/and "that's an interesting story, but we're a lineage society".....I spent the first month after regaining my health working on the genealogy of Samuel Winslow. I'm ready to resubmit the application. Anyway, I went up to Salt Lake City for three days of research and did find several things--including a tie that Margaret Woolsey Winslow was married to Samuel Winslow. That should overcome the comment made on the Mayflower application that my connection of Margaret Winslow to Benjamin Woolsey was "weak" (Benjamin Woolsey's will names Margaret Winslow)--and the headstone didn't identify her with her maiden name. For those of you interested, that's p.22 of Biographical Memoirs of Wyandot County Ohio--John R. Jurey. If anyone knows where there is a marriage record---I'm still interested and stumped. Another interesting item I found for all you Joseph Winslow/Margaret seekers are two documents...one names the children of Joseph Winslow--are your ready??? Declarations, pleas records of the Court of General Session and Common Pleas, 1721-1864 (FHC film#565229) names Margaret Winslow the widow of Joseph Winselow deceased and John her son aged six years, David aged four years, Stephen aged three years and Sarah aged four months from the precinct of Charlotte to the precinct of Rumbout. Its dated 9 October 1772. Bad news, the court case is between the Overseers of the Poor of Rumbout and Charlotte making Margaret return to Rumbout...The other reference is a few pages earlier between the same two Overseers of the Poor dated 8 October 1772. So not only did we get an approximate date of Joseph Winslow's death, we also got the names of his children also.